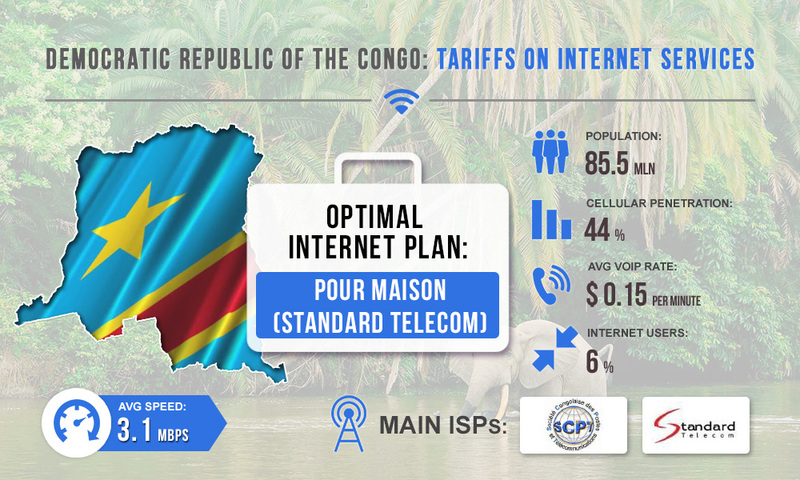 Telecommunications infrastructure is weak in the Democratic Republic of the Congo, which holds back the development of the broadband access sector. Nevertheless, the country has been connected to the International Network via fiber-optic cable since 2013 that provided a higher quality Internet. But how did it affect the cost of the Internet services and how much will it cost to connect the Internet for GSM traffic termination? Despite the deployment of fiber-optic National Network, the networks capacity is still limited in the Democratic Republic of the Congo. At the same time, prices for services are quite high. Let's discuss the tariffs on the example of one of the most popular providers in the country - Standard Telecom. The most suitable offer for traffic termination is XSPEED (fiber optic Internet services). Pour Bureau. An offer for businesses. Available speeds are 1 Mbps (cost - $180 per month) and 2 Mbps (cost - $360 per month). Pour Maison. An offer for individuals (home Internet). Speed - up to 1 Mbps, cost - $86 per month. The fiber-optic Internet is an excellent solution for uninterrupted operation of VoIP equipment and voip sip server software, but the proposed speeds are too low. To ensure the gateways’ operation, you need an Internet connection at a speed of at least 42 Kbps for each port. If you accept Pour Maison's offer, you will be able to work with a minimum number of channels. Business expenses on the Internet will be $86 per month for each. Also note that you need to make a one-time $90 payment for connection via fiber optic cable.